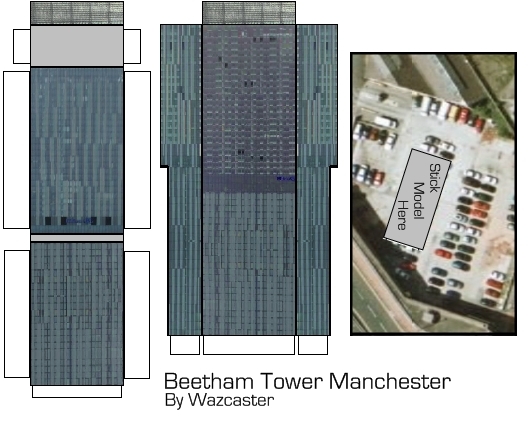 The tallest building outside of London (taller than many buildings inside of London), the Beetham Tower Manchester is 169m to the facade overrun. The tower houses many apartments and also the Manchester Hilton. The tower was finished in 2006 and overtook the Holoway circus tower in Birmingham as the tallest outside of London (that had overtaken Manchester's CIS Tower that very same year). At the 23rd floor it juts out 4m on a cantilever. You should know how to download it by now. I've gone all out on this model (even the base is textured) so you'd better bloody like it.